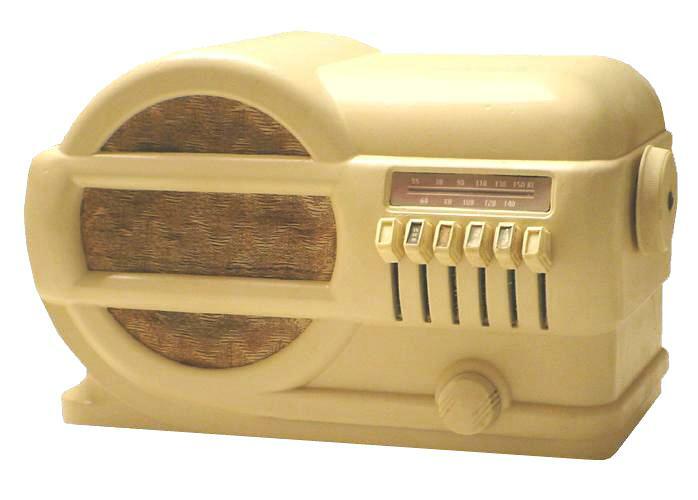 This neat ivory-painted and deco Belmont was purchased at a radio meet for five dollars. It needed a good deal of cosmetic repairs; it was missing a dial, had several paint chips all over the case, and one larger chip in the cabinet on the right side. The cabinet was lightly sanded down with fine sandpaper to smooth out the surface and the chipped area was repaired with a piece of plastic. Several light coats of ivory paint were sprayed on the case. A new dial was reproduced on Microsoft Paint after close observation of photographs of other Belmont 519 radios. The final dial as shown below was printed out on paper and sandwiched between two pieces of transparencies. The electronics, as usual, only needed recapping and the chassis was cleaned. The 519 was also available in a bakelite cabinet.